Home Trevor Anton Could It Be Possible? Title: Could It Be Possible? COULD IT BE POSSIBLE? Could it be possible that there is a way to experience the Creator, the Source of the Universe? Have you ever wondered just why you are here? What is the purpose of life? 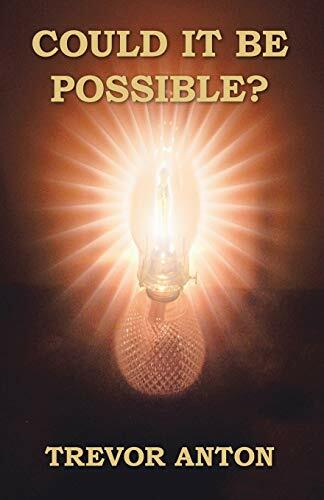 Trevor asked himself the same questions many years ago and this book is the result of gaining some answers to this age-old quest for inner knowledge. It takes the reader on a journey from conception to enlightenment describing the spiritual experiences of two sixteenth century Christian saints, St. Teresa of Avila and St. John of the Cross and two twentieth century Hindu saints - Yogananda and Muktananda. The author then turns to the Bible, examining the four gospels, with particular emphasis on the deeper and hidden message of Jesus. Trevor also relates his own spiritual journey and how this has shaped his life. The book concludes with the possible future for mankind. In 1967, at the age of nineteen the author began searching for the purpose of life. This search led to him meeting many different types of people and reading many varied books. He came to the unmistakable conclusion that, in order to know truth we need to experience it within ourselves, as that is where the truth lies. To go within meant meditating so after several experiments with various types of meditation the author settled on Transcendental Meditation as it was non-religious. As he began to grow within himself, Trevor wanted to find the deeper values of life. He studied the theoretical aspects of TM in order to understand his personal experiences then went on to become a teacher of meditation himself. In his mid thirties Trevor remarried, had four children and devoted his time to raising a family while teaching meditation part time. In 1996 he emigrated from England to Australia and now lives south of Perth in Western Australia. Over the years Trevor has had a variety of jobs including being a clerk, computer operator and programmer, podiatrist, carpenter and real estate agent. Over the years Trevor has come across many people asking the same questions that he asked himself all those years ago. He has now reached a point in his life where he feels able to answer some of those profound questions. His whole purpose in writing this book is to inform people that they can develop further. They can gain all the positive benefits mentioned through deep meditation; to live life in bliss and perhaps gain what the saints in this book experienced.